After last week's leaked news about Google launching its own physical credit card to sit alongside Wallet, a new help site seems to have confirmed the search giant's intentions. 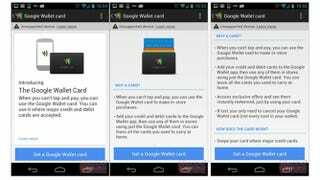 According to the report, the card will use the default payment method for your Google Wallet account, and you can order it to your house right from the app. Which seems pretty convenient, and it's a nice way to route all your expenses through Google Wallet if you shop at a lot of places that don't have NFC (of course you do). Carrying just one credit card around would lighten up your wallet, too.